Dogs are generally blamed for eating homework assignments moments before they are due. This particular canine, however, should avoid going to school altogether as he’d probably be sent to detention for falling asleep during an in-class assignment. Smuggler, the furry four-legged first mate of Sharon Wells, dozes off with a copy of The Log in front of him. 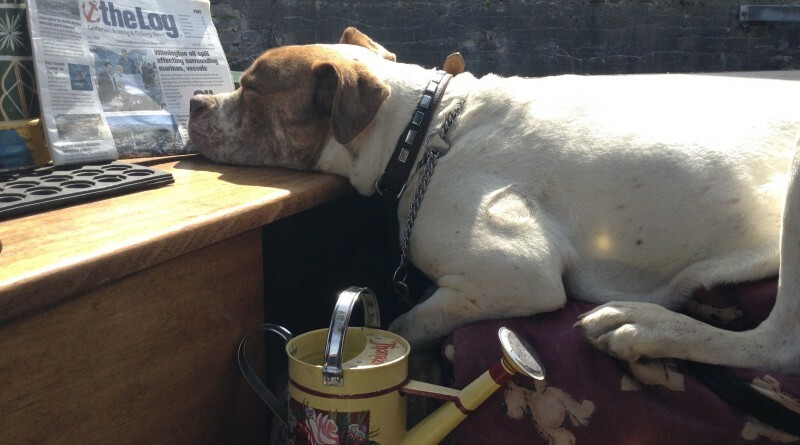 Sharon and Smuggler were aboard the narrowboat Thomazina at the Gloucester Docks in Great Britain. “This small print is hard on the eyes after a hard day’s cruising,” Sharon wrote to The Log after sending us this photo of Smuggler dozing off in front of The Log. Gloucester Docks, where 10-passenger narrowboats are available for rent, is just east of Wales in southwest England and is the country’s innermost port. Queen Elizabeth I granted the docks port status in 1580. The city of Gloucester, where the docks are located, was founded as a military fortress during Roman occupation. Gloucester was captured by the Anglo-Saxons after the Fall of Rome and continued to be of strategic military value for the English. Henry III was crowned in 1216 at Gloucester’s St. Peter’s Abby. City officials say it was the only time an English monarch was crowned outside of Westminster.